New Product Announcement: THIC3000-35A with Everything you need. THIC SERIES INVERTER CHARGER WITH EVERYTHING YOU NEED. THOR Manufacturing is excited to announce the highly anticipated arrival of the THIC, Inverter Charger Series. One of the key differentiators with this new inverter is that it is available in a complete package with everything that you need to install the unit. The IC Series 12 volt low frequency power inverter charger transforms dc (direct current) power, stored by batteries, into ac (alternating current) electricity that can be used to run your various tools and appliances. This inverter also has a built in ac-to-dc battery converter charger, which allows users to recharge their battery bank from an ac source such as a fuel-powered generator, shore power or a regular outlet at home. The built in battery charger features a seven type battery selector and 3 stage charging, for safely and effectively charging your battery source. Use this product for renewable solar, off-grid, mobile and emergency backup power applications anywhere that uses 110 or 120 volts of alternating current. 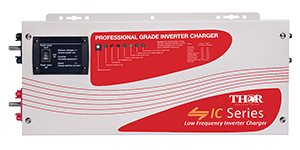 The THIC inverter charger is equipped with a 9000 watt surge capacity for up to 20 seconds, specifically for devices with high startup needs, like motors, compressors and pumps. A key factor that Upfitters and Installers take into consideration when procuring products is simplicity in ordering. 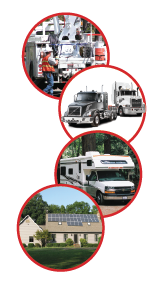 It takes up so much time to source all of the different components that are needed to install an inverter so, we at THOR Manufacturing came up with a complete package that includes everything you need to be up an running in no time. Contact your sales rep for additional information. For more information about the THIC Inverter Charger family of products, please contact a Thor Manufacturing Sales Representative today. Over the coming months, THOR Manufacturing will be adding new videos to the their Youtube Channel. Be sure to subscribe when you’re their.